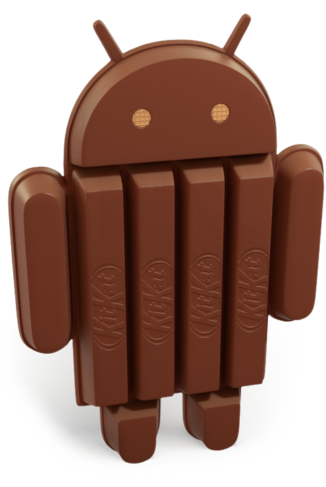 Following Androids OS naming system all versions of their mobile OS appear to be named after sweet foods and the latest 4.4 Kit Kat truly does offer us something sweet to rave about. It’s been out for around a year now and like its snack name sake this is silky smooth morsel will leave you salivating for more. While at first glance there may not appear to be a huge visual difference in this latest’s rendition those familiar with the previous Android versions will notice a number of subtle changes such as the black background from the notification bar has been removed and the status icons for Battery, Data and Wi-Fi are white, but aesthetics aside the new Kit Kat OS is more than just a cosmetic update, here are some of my favorite features. It’s certainly faster and that’s because rather than making the system requirements greater which is usually what happens when OS versions are upgrade they have steamlined the OS and improved the way it handles the phones memory resources and processor speed so as the system requirements have gone actually gone down meaning that you get more performance for less, fantastic. As a knock on effect on to this developers can use this better system resourcefulness to create much higher performing apps. The Dialer, which is after all what a phone is about, has been updated so now your most frequently contacted numbers will appear higher in the contacts list than those people who you rarely call, which is a nice little default setting making the system more functional. Another nifty upgrade is the ability to search for places through the contacts window. So if you want to do your dry cleaning then type in dry cleaners and it will bring up the nearest dry cleaners. Great for when you’re in a new city. There is full screen app mode called “immersive mode”. This can be used to remove all of those distracting on screen icons and tool bars which works well with apps such as e-book readers allowing them to utilize the full screen without showing tool bars so it improves the experience and makes using these apps even more enjoyable. You can easily recall the interface by doing a swipe down from the top of the screen. Perhaps one of the major changes and Android’s answer to Apple’s Siri is Google Now. You can access it by saying the magic words “OK Google”, when on the home screen. You will then be prompted to give more commands which can be anything from a web search to setting a reminder. Many of us have been there. It’s painful and upsetting, not only will you lose your contacts, pictures and personal data which could be disastrous if they fall into the wrong hands, but your highest score on candy crush will be gone as well and you will have to start again. Well you can’t get that back but Google has helped you stop this data from falling into the wrong hands as you can now wipe your phone remotely. Remember you will need to enable these settings before losing the phone. By going to the Google Settings application and selecting the Android manager you can turn on the “Remotely Locate This Device” option and “Allow Remote Lock and Factory Reset” this will allow you to change the lock screen password and wipe the entire device in the event you lose your phone. Just make sure is actually lost first and hasn’t fallen down the back of the sofa.